Roger and I headed down to the Casbah for Anti-Monday League to checkout bands that we haven’t seen (or heard of) before. We hadn’t done his in a while so we though, what the hell… and made our way down. Tim Pyles from FM94/9 hosts and DJs on these nights. Anti-Monday League happens each Monday at the Casbah featuring the opener of Pyles choice and other bands trying to make a name for themselves. Before the first band came on, Pyles shared with us some music that he was personally into right now. Unfortunately I am really poor with names, and have forgotten most of what he played for us. Damn memory. Some I liked, some I could pass on, but to each their own. Pyles shared some information on the first band on the bill, the Austin James Band. The band is semi-local with band members split, living in Orange County (Long Beach) and here in San Diego. They used to play around a year or so ago, but took a “break” to play as the back up band for Godspell, a 1970’s off broadway musical. Interesting… Pyles also described them as poppy, yet hard to describe. He explained that they are definitely worth a listen to form my own opinion of their style. And that I did. The first thing I thought of as they started playing was a carnival, very whimsical. It made me happy inside… I was also excited to enjoy a band that I had no real preconceived notion about. Roger was very excited over the gadgetry on stage. The band used various added percussion toys such as whistles, wooden blocks, crashing cymbals and a crank. Of the two keyboards on stage, one was set to play lie a xylophone. With all of the bells and whistles (literally), it was already easy to be in awe of this foursome. The lyrics and melodies made me think I was sitting down listening to a children’s story. But there is more… the harmonies, vocal layering, technical skills on their individual instruments and song composition made me think I was listening to something out of the Beatles, Sergeant Peppers Lonely Hearts Club Band or The Beach Boys, Pet Sounds. It is hard for me to put this band up on a pedestal along side the greatest composed albums of all time, but I really think it must be done mainly because there really is nothing else to compare it to. It was great to see their smiling faces after the show as Roger and I both picked up CDs. 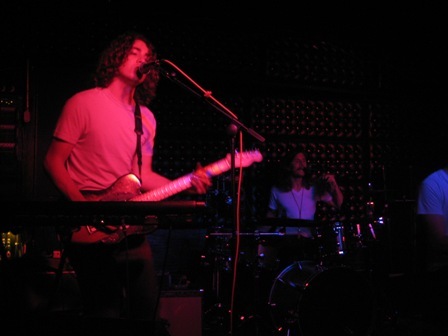 So the next time they are around, please go check them out… Aug 28 at the Beauty Bar and tell me what you think. Roger and I stuck around a bit longer to see Frightened Rabbit since Tim Pyles was raving about them earlier. I truthfully was tired and ready to head home but I at least wanted to see a few songs. The band was definitely engaging. From Ireland, the band told riveting stories between beautiful songs that you could feel the emotion behind. The last time that they were here was during the 2007 fires, playing a show at the Casbah for about 2 people. I don’t remember the Casbah being open, but I think I was in a hole that week. Maybe it was the Scottish accent or maybe because their songs reminded me of another band (that I still can’t think of), but Roger and I ended up staying until the very end of their set, ducking out after purchasing a CD.